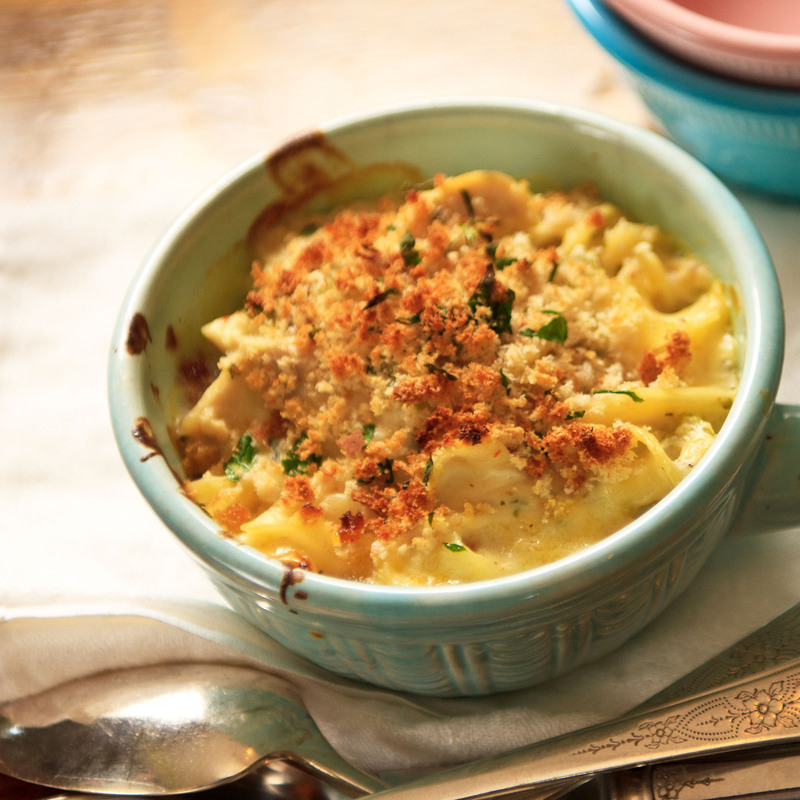 Chicken and Noodle Grand Cassolette. See instructions, below, for baking in individual casserole dishes. Photo by Richard Swearinger. We often think of pasta as Italian, and casseroles as mid-century American, but you’ll find recipes for both in my book. That’s because French cooks have their own takes on everything from shepherd’s pie to lasagna. Like us, they often rely on pasta as the base of a quick, nourishing meal. Of course, by using quintessential French ingredients, the dishes become unmistakably French. Here’s an example. To a creamy and comforting chicken-noodle bake, I’ve added favorite French ingredients: tarragon, shallots, and Comté cheese (substitute Gruyère, if you like). The result? French elegance and American comfort in one warming (and wonderfully easy) dish. To get this to the table even more quickly, use chopped rotisserie chicken from the deli rather than poaching the chicken breasts. For a discussion of casserole versus cassolette versus cassoulet, see this discussion on BonjourParis.com. 1. Place the chicken breasts in a medium-size saucepan. Add water to cover by 1 inch; season with salt. Bring to a boil; reduce the heat to an active simmer and cook until the internal temperature of the chicken registers 170°F on an instant-read thermometer, about 20 minutes. Drain, cool slightly, and cut into bite-sized pieces. Transfer to a large bowl. 3. Cook the noodles according to the package directions; drain and add to the bowl with the chicken. In a bowl, stir together the bread crumbs, parsley, and olive oil and set aside. 4. Melt the butter in a medium-size saucepan over medium heat. Add the celery and shallots and cook, stirring, until tender but not brown, 4 to 5 minutes. Stir in the flour, tarragon, cayenne pepper, and salt and pepper, making sure all of the flour is moistened by the butter in the pan. Cook and stir for 1 minute. Do not allow flour mixture to brown. Gradually add the milk, stirring with a wire whisk until combined. Cook and stir until thick and bubbly, then cook and stir 1 minute more. 1 1/2-quart casserole dish. Sprinkle the top evenly with the bread crumb mixture. 6. Bake until the casserole is bubbly and the topping is golden, 20 to 25 minutes. Allow the casserole to stand for 5 minutes before serving. NOTE: If you wish to bake and serve this casserole in individual dishes as pictured (which is the way a bonne femme would likely serve it), use six 10-ounce custard cups or ramekins and place them in a shallow baking pan. Bake for about 20 minutes. • American “French” Dressing: Another good choice for dressing a green salad. With the weather turning cool, I am craving dishes like this. Delicious! I’m new to your website and am looking forward to trying your recipes! I see your French Chicken and Noodle Casserole calls for only 4oz. of noodles. This seems like such a small amount, especially in relation to the proportions of the other ingredients. Can you verify that this is indeed the correct amount to be used? Indeed, 4 ounces is correct. I’ve always found that you need fewer egg noodles in a dish than non-egg pasta (like spaghetti and such). I also don’t like to “bulk up” my casseroles with too much pasta. I found that this made for a creamier dish. I made the casserole but because I have a 13 y.o. son with a huge appetite, I did add more pasta. We all loved the dish! Thank you so much for providing easy to follow, every day French recipes! Glad to hear you improvised. That’s what “bonne femme” cooking is all about!